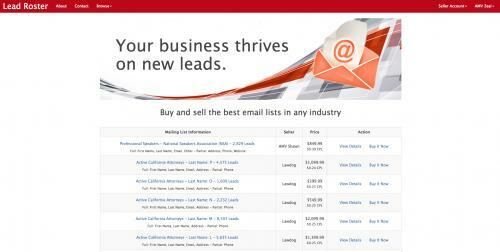 American Marketing Ventures launches new Lead Roster platform for businesses to buy and sell email lists. Salespeople are thrilled, but is data transparency really a good thing? SAN FRANCISCO, CA / ACCESSWIRE / February 10, 2016 / Sensitive data is now making headlines several times a year, as hacks and intrusions reveal private personal information, from Target to Ashley Madison. As a result, people have become fiercely protective of their data, while unaware that almost every free service they use, from Google to Facebook, harvests this data for profit. The difference lies in how this data is sourced with permission under their Terms of Service. Now, American Marketing Ventures (AMV) is enabling more businesses than ever to join in this same practice with B2B leads, in a controversial new marketplace called Lead Roster. The website enables businesses of any size to sell their existing contact lists to other businesses, enabling them to share information and generate "found money" by monetizing lead lists that were of no further value. The Business To Business nature of the contacts available means the general public has nothing to fear, while businesses can target new potential leads faster and easier. The new site, Lead Roster, displays individual mailing lists for sale with details of targeting, how many leads are included, information on the seller, and details on what type of information is included with each lead. There is transparent pricing and a simple "buy now" button so buyers can get instant access to the information, which the businesses selling may have gathered over a period of years. Buyers are protected by the seemingly harsh but fair "95% Deliverability Double Guarantee," which AMV enforces upon all sellers. Zeal Caiden, co-founder and CEO of AMV, had this to say about building Lead Roster, "It all happened so organically. We had these email lists lying around from our B2B cold email campaigns... Everyone who practices 'predictable revenue' does. One day I realized we could just share these lists and provide a ton of value to other companies who sell to the same industries. The incumbents in B2B lead generation are charging up to $3 per lead just for a targeted name and email. Three dollars per lead! I knew in my gut that opening up this opportunity for regular businesses like ours to sell their prospect lists, after they're done with them of course, would create an incredible opportunity for both buyers and sellers. We all want high-quality leads for cheap!" When asked how he felt about publicizing contact information that could be considered sensitive data, Zeal replied, "Look, the most profitable companies in the world are already making billions selling your data without you knowing about it. And we aren't going after consumers, mind you. The reality is that if you are in business, you are going to get unsolicited contact requests. This is necessary. This is legal. This is CAN-SPAM compliant. It's the way the world has to work in order to create valuable partnerships and get business done." Zeal went on to add, "I think the bigger question is, and trust me I'm curious for the answer to this one myself, is that if we created a platform to make business contact information more transparent and available, and gave every business equal opportunity to profit by making that data more accurate, would the result be net positive for commerce worldwide? I think so, my team thinks so, my friends responsible for revenue at their companies think so... so we're doing it and we'll see what happens. If you're curious or have something to say, here's your first email lead for free: zeal at GO AMV dot com." About American Marketing Ventures: American Marketing Ventures, Inc. (AMV) is the innovative company behind the world's most loved content marketing and SEO platform, Anova, that allows you to run full-scale, intelligent campaigns without ever dealing with uneducated salespeople. Called "a playground for smart marketers," AMV is committed to making customer acquisition simpler and easier for businesses worldwide.